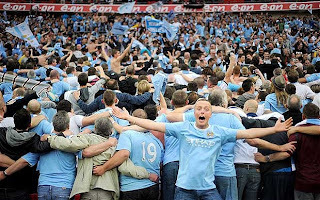 Manchester city won FA cup final against Stoke City by 1-0 and entitled themselves as FA Cup Champions 2011. Stoke City who were performing great in the past few matches, couldn't score against Man City and lost this match as well as FA Cup trophy. First half of the match went goalless with yellow card to Robert Huth. Both the teams were desperately looking to hit the net in the second half and at 75th minute of the game, Yahya Toure for Manchester City hit the back of the net that gave Man City 1-0 lead and also, it secured victory and FA cup title as there were no gaols found from Stoke City till the end. Below are the match details + highlights and yeah, Congratulation to Manchester City. 0 Respones to "Manchester city won FA Cup by defeating Stoke city in the Finals [Highlights]"